Not your typical surfer. Not your typical artist. Not your typical collection. 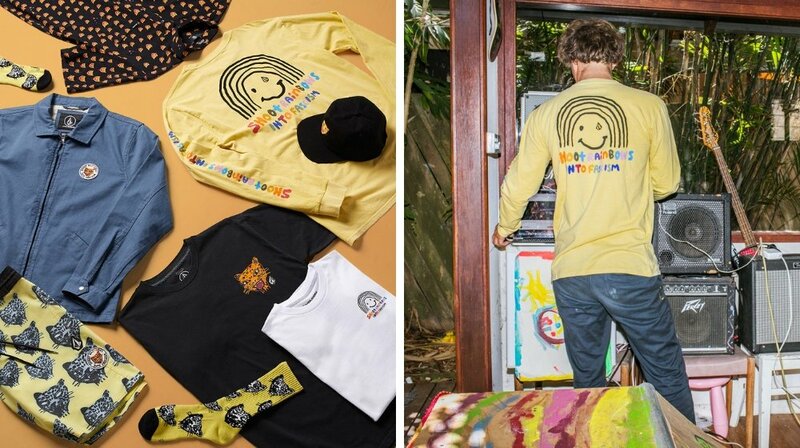 Ladies and gentlemen allow us to introduce ‘Shoot Rainbows’, the latest collaborative collection by Ozzie Wright and Volcom. 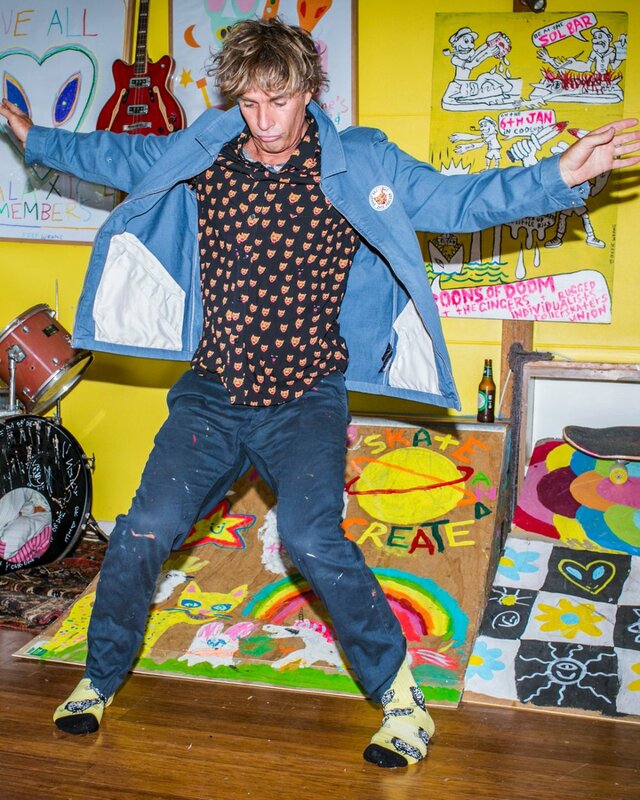 Featuring a solid mix of quality tees, boardshorts, shirts, jackets and accessories, ‘Shoot Rainbows’ lives up to the hype of the pairs collaborative pre-accessors, embodying bright colours, eye catching characters and subliminal, informative messaging. So, are we backing it you ask? Throw a tick next to that question because our answer is with good reason! Take our word for it and check out the full collection and feature clip below, then keep scrolling as we chat Ozzie to learn more about its fruition, inspiration and much more! We're excited to bring this one to your screens and furthermore, your wardrobes. Yeah Oz! Welcome back to SurfStitch! Thanks for catching up! We’re here to celebrate your latest collab collection with Volcom. Tell us all about it! Well, there are a lot of rainbow spotted leopard heads on most of the pieces, then there is a yellow shirt that says 'shoot rainbows into fascism on it', which is good advice if we are gonna start a revolution and save the earth from all the billionaire moguls who don't care about our beautiful planet! There’s a few similarities in line with other collections you’ve done in the past, plus a few new messages. What was the inspiration behind it all? The first time I painted that rainbow leopard head was in a bar in Rio de Janeiro a couple of years ago. I was inspired by the jungle and all the animals, trees and people over there. I was writing things like "barbarian jungle spirit" on walls. Fast forward a little and I was driving around in a car that I'd spray painted the sh*t out of with my face painted like a skull. I had a crazy rat tail dread lock hair extension I'd gotten off these african ladies in a Sao Paulo hair salon. It was an amazing trip and where the inspiration first started. What about the creative process of bringing each piece to life? From first putting pen to paper to eventually having them on the garment? To be honest, I leave a lot of the actual clothing design to the Volcom design team because they are really clever and I'm always surfing. The bluey grey jacket with the patch is one of my all time favourite jackets, it's so versatile and works for so many occasions. It's light but can still keep you warm, it's casual but also looks great at a party. 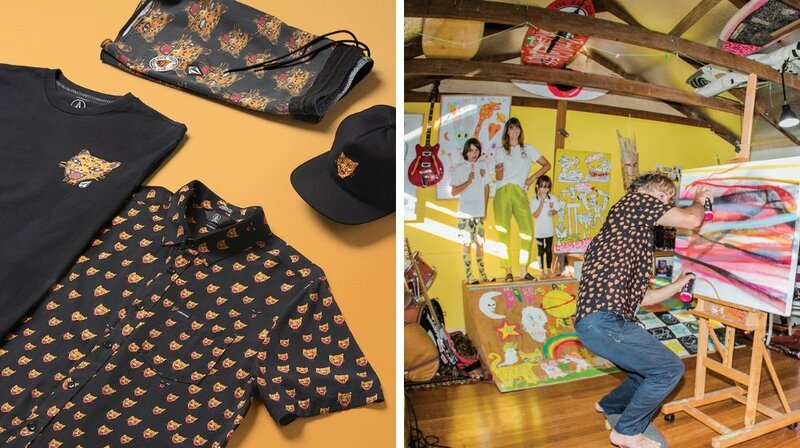 I also love the black button up shirt with the cat heads all over it. It's super nice, lightweight fabric and I like the shape and fit of it, and of course, like I said, like the yellow catheads all over it! Lets also touch on the motion pieces, who are the crazy brainchildren between these and how do they capture the Ozzie Wright x Volcom message? If you are talking about the spray painting video which is what I made to promote the collection, it's a new song I wrote about spray painting stuff. I just wanted to make a video for it because I had a lot of material ready to go as far as things I'd already painted and I've been wanting to skate with friends while we paint a wall for ages. It was great to finally have some of these guys participate and to see this idea come to life!